I just finished Ava's pj top to go with her new flannel pj pants. I used some of my alphabet ion on patches to decorate it. 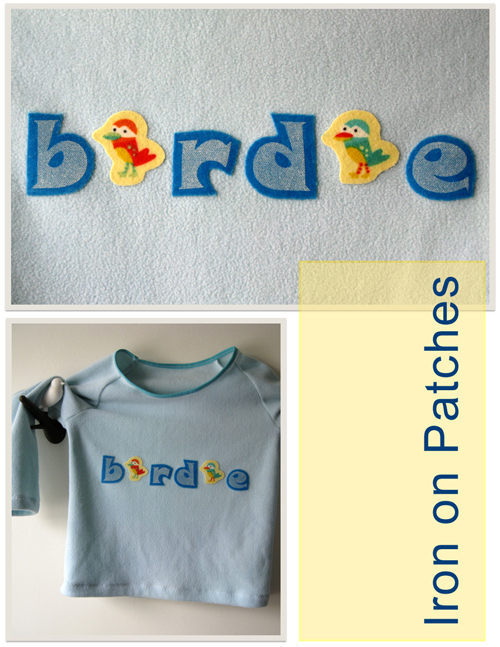 Instead of using 'i's I used birdie flannel scraps from her pants. I haven't sewn any of the patches on, the iron on stuff works brilliantly well. If it does start to peel off, I will stitch it down then....I am all for easy peasy and quick solutions! After all the cutting, dying, sewing and ironing, I have to confess that I am a bit annoyed with myself. The sewing pattern I chose appears to have a very low front neckline! Silly me...will have to see what it looks like worn, then make some fix-up from there.